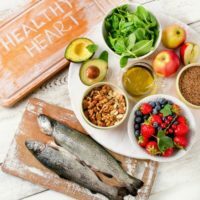 Home » Family & Kids Nutrition » Participate in American Heart Month! Participate in American Heart Month! It’s the second month of the new year, and you’re working hard to keep up with your resolutions. February is American Heart Month, so devote this time to raising awareness about how you and your loved ones can prevent heart disease. Think about what health goals you want to focus on for the next few weeks. Now schedule in time to work on those goals! If it’s meal planning, block off an hour on the weekend to plan out dinners; if it’s fitness, schedule in when and where you plan to exercise the next seven days; if it’s cutting down on sodium, start reading and comparing food labels. Here are some helpful tips on how to effectively set and achieve your health goals. Cut down on salt. Keep a flavorful herb-spice blend on the kitchen table in place of the saltshaker. Purchase Trader Joe’s 21 Salute or Ms. Dash or make your own combination. I like a mix of cumin, smoked paprika, cayenne, and garlic powder! Try some low-sodium recipes, like this cauliflower soup or egg tacos. Keep cinnamon or unsweetened cocoa out to help sweeten up or provide a fulfilling flavor boost to coffee, tea, morning cereal or yogurt. If you’re struggling with sweet cravings, read how to conquer sugar cravings naturally, then commit to at least one action each week. Move more. Encourage your friends and colleagues at work to incorporate more movement into daily work. If you have a desk job, see if you can get an adjustable stand for your computer so you can switch between sitting and standing. Make a pact with a colleague to use the stairs together if it’s no more than five flights -social accountability increases your odds of sticking with it! Text a friend or colleague with random exercises you both commit to, like wall pushups or chair squats. If you have children make sure, they’re getting daily exercise too. Talk to your school’s administration about increasing recess. Many schools have recess only once per week. Read: What’s Happened to Physical Education. Eat more at home. Cook and eat at least 75% of all your meals at home. Cook foods at home so you can control the use of unhealthy fats, excess salt, sugar and refined flours in your diet! Check out my recipe section for tasty ideas! Here are some popular meals to try this month, Faster than Fast-food, 5 New Recipes to Try, Recipes to Beat the Dinner Dilemma, Tasty Walnut Recipes, and Quick and Tasty Breakfast Ideas. Meal assembly counts as cooking too! These quick and easy refried bean tacos below have significantly fewer calories than dining out and can take less than 10 minutes to make! 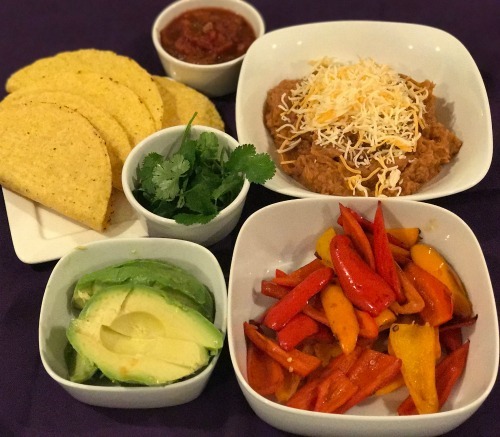 Just heat up a can of healthy refried beans (made without animal fat), lightly toast corn taco shells (they toast quickly keep an eye on them), and mix in salsa, low-fat cheese, avocado slices and any left-over veggies. Cumin, salt, and lime add more flavor. Spice it up! Breathe Fresh Air. Get outdoors in nature when you can, even if that means a weekend drive to a higher altitude. Always remember to stay away from second-hand smoke! I’m still so shocked to see young people smoking. Encourage them to quit but make sure not to be around them when they smoke. E-cigarettes are harmful too! Know Your Numbers. Take action and get your blood cholesterol, blood pressure and fasting blood glucose checked this month – schedule an appointment for early this month! Subscribe to my seasonal e-newsletter for more healthy and realistic inspiration on MelissasHealthyLiving.com home page! If you have kids, visit www.superkidsnutrition.com for more nutrition and fitness tips that work. « This Year’s New Year’s Resolution: Sleep On It! Comment on Participate in American Heart Month!